Those who have played a great number of hidden object/adventure games will agree with me that some of the things that come to your mind first when you hear the name of the genre are mystery, treasures, some kind of magic, a murder, lost whatever, and of course one or several adventurers. 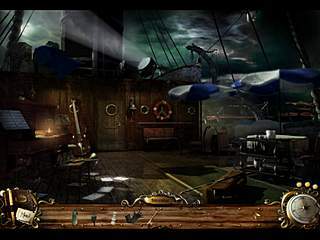 Curse of the Ghost Ship is a classic example of those game. It has pretty much everything you would expect. 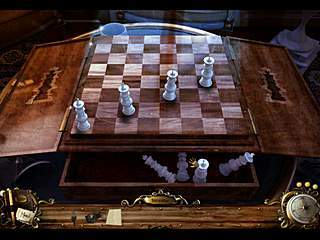 The few hidden object searches that there are in the game are quite challenging. In Curse of the Ghost Ship you play as a young treasure hunter Annie O'Connors. So the whole story is around a gem. This imperial diamond was lost about 80 years ago with the ship that sank. As you can see from the title, it is not going to be just some diving story, but rather you are going to deal with the unexplainable ghost ship. Wondering around the ship works more as adventure style game where you go and explore and combine some items to move on. There are hidden object levels, but they are really few. I guess if you are more a seek-and-find kind of player, this game might not be for you. The few hidden object searches that there are in the game are quite challenging. Mostly because the scenes are too dark and some of the items on the list don't say clear what to look for. This might be the biggest problem with the game. You just not sure what you are looking for or what to do next. The general atmosphere of the game is rather dark and doom. It corresponds the intriguing story that unfolds before you. But it takes a lot of reading of the dialogues to follow it. The graphics are sometimes too dark, but you can fix that in the settings. Hopefully these few guidlines help you understand if you really want it, and never underestimate the power of the trial version. This is Curse of the Ghost Ship review. Download this game here.